Home / How to set up ELEX WooCommerce Australia Post Shipping Plugin with StarTrack Account? 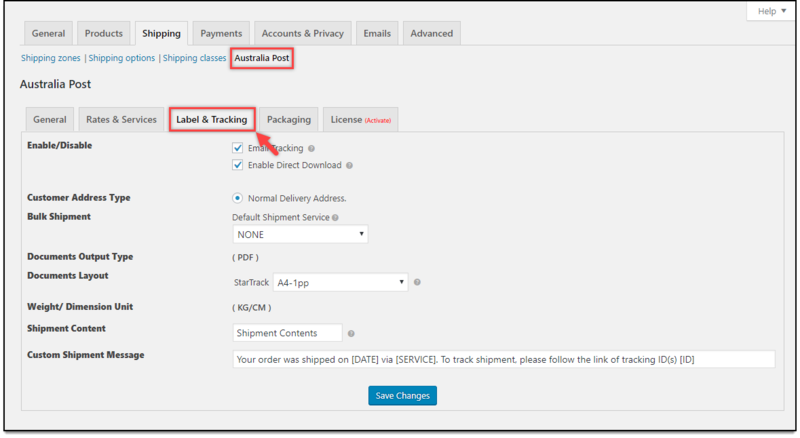 In this article, I talk about setting up ELEX WooCommerce Australia Post Shipping Plugin with Print Label & Tracking using StarTrack account. For setting up the plugin with regular Australia Post eParcel account and other settings, read our main documentation. Refer the product page to know more about other various features of the plugin. What is Australia Post StarTrack Courier? StarTrack courier service is one of the modules of Australia Post shipping service. It caters only to domestic regions of Australia like CBD (Central Business District) of Melbourne and metropolitan areas of Australia’s major capital cities. If your store is located in Australia and you ship only within Australia, then StarTrack service can be suitable for you. Unlike Australia Post eParcel services, StarTrack does not have complexities for domestic shipping service. The services are relatively faster and unambiguous. To use StarTrack service, you need to have an Australia Post contracted account. Based on your contracted account, the services may differ in the API you use to access the real-time rates. The Shipping labels and Order manifest for StarTrack account differ from the regular eParcel account. Other Australia Post services like Shipment tracking, Extra Cover (Insurance), and Signature option apply for both eParcel as well as StarTrack contracted accounts. A complete, step-by-step explanation is already given in the main documentation of the plugin with the eParcel account. This article will discuss only specific settings that are affected by the StarTrack account in the plugin. For other plugin settings, follow the link given in respective instances. 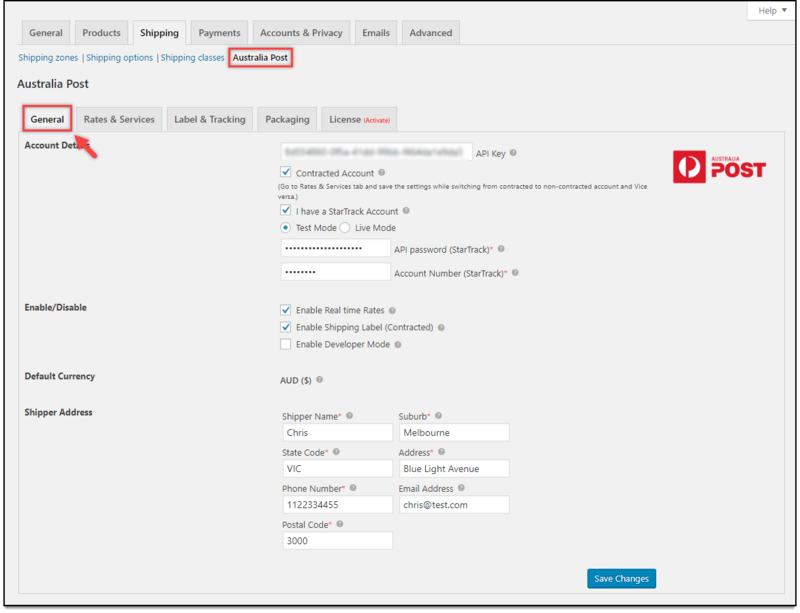 You can access the ELEX WooCommerce Australia Post Shipping Plugin settings from WooCommerce > Shipping > Australia Post. How to print WooCommerce StarTrack shipping labels? How to generate WooCommerce StarTrack order summary/manifest? How to generate Australia Post StarTrack shipping labels in bulk? 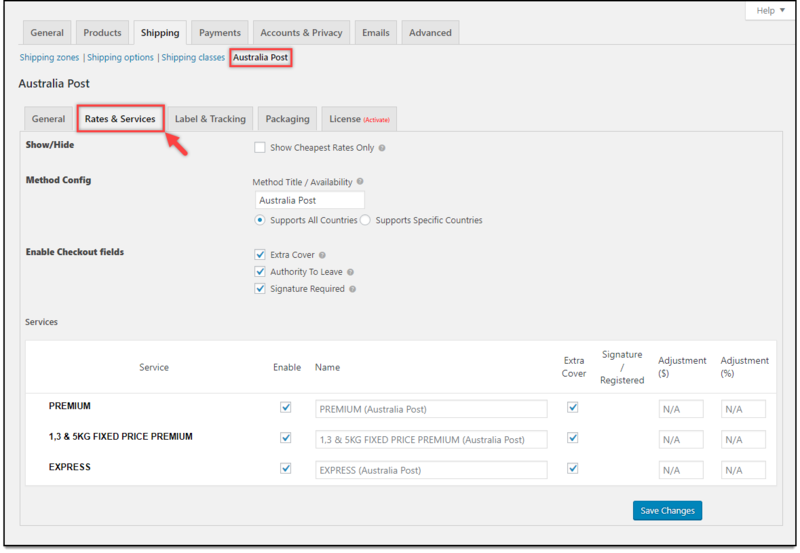 How to configure WooCommerce Australia Post StarTrack shipment tracking? In this tab, you can enter your Australia Post API keys and StarTrack account credentials to access Australia Post real-time rates and services. The complete settings are as shown in the screenshot below. API Key – Enter the API key that you have received from Australia Post after you have registered for an account. This API key is applicable for both contracted and non-contracted account. Contracted Account – To use contracted account rates, tick the respective checkbox. Further settings appear where you need to enter API password & Australia Post Account Number and choose either Live or Test mode of transaction. Enabling StarTrack – To enable StarTrack account, tick on the checkbox ‘I have a StarTrack Account’. Enter the respective StarTrack credentials and choose the mode of transaction. Quick note: The API Keys for StarTrack and regular Australia Post eParcel account can be same, but the API Password and Account Number will be different. Hence, make sure you use the right credentials. Enable Real-time Rates – Tick this checkbox to access StarTrack real-time rates on your WooCommerce store. Enable Shipping Label (Contracted) – Tick this checkbox if you want to create a shipment, generate and print shipping labels for your orders. If this setting is unchecked, you can still access real-time rates, but will not be able to create shipments for your orders. Enable Developer Mode – If you are having trouble getting real-time rates, creating shipments, or configuring any settings of the plugin, you can tick this checkbox and trace issues using log. You can see information about debugging at the top of the cart and checkout pages. After enabling debug mode, add a product to cart. Go to cart or checkout page to see the debugging information. iii) Default Currency: This shows you the default currency of Australia Post. iv) Shipper Address: Enter shipper name, address (the address from where the items will be shipped), contact number and email address in the respective text-fields. Click Save Changes once you have configured all settings. Go to WooCommerce > Shipping > Australia Post > Rates & Services. This tab contains settings for configuring Australia Post StarTrack services and how they will be displayed on the front-end of your store. i) Show Cheapest Rates Only: This option shows services only with the cheapest quote from the enabled Australia Post StarTrack services in the Services section (discussed in the later part of this article). Method Title – Enter a custom method title for Australia Post shipping method. This method title will be displayed on the cart and checkout pages. Method Availability – This field allows you to select countries, for which Australia Post shipping method will be available. Supports All Countries: Choose this option if you offer Australia Post shipping method to all over the world. This option is selected, by default. Supports Specific Countries: Provides option to select desired countries. The Australia Post shipping method will be available only in selected countries. iii) Enable Checkout fields: These options will be available to the customers on the checkout page. Extra Cover – This setting is used to add insurance amount to the product. Once a customer enables this option on the checkout page, $2 will be charged per $100 of total product amount. For example, if three products of $30 each are bought, then the extra cover amount will be $2. Hence the total amount will be $92 ($30×3+$2). If a customer adds one more product of the amount, then the extra cover amount will be $4. Hence the total amount will be $124 ($120+$4). Authority to Leave – Once this option is checked by the customers, the package can be left at the door. Signature Required – When enabled by the customer, the package delivery person must take a signature of the person accepting the package. An amount of $2.95 is charged for this type of service. iv) Services: Based on your Australia Post StarTrack account, the services will be dynamically shown to you in this table. The services may differ from one account to another. In this table, you can enable desired StarTrack services, give a custom service name, add Extra Cover (insurance amount), and set price adjustments. You can read the Price adjustments use-cases explained in the main documentation. Quick Note: The Extra Cover option in the Checkout field (for the customers) will override any Extra Cover setting defined in the Services tab. The label and tracking settings for the StarTrack account are as shown below. Email Tracking – Tick this checkbox to send shipment tracking information to your customers via email. Enable Direct Download: Tick this checkbox to configure a single click download for labels, instead of following the traditional document printing procedure. Normal Delivery Address – For customers with general house address. This option is the default for StarTrack courier service. iii) Bulk Shipment: Choose the default service for bulk generation of StarTrack shipment label. The services listed here are dynamic and similar to what is listed on the Services tab for real-time rates. This label generation is processed in WooCommerce Orders page. If there are no shipping services defined for an order, the default service selected in this setting will be taken into consideration. iv) Documents Output Type: Shows the default output format for printing documents, that is PDF. v) Documents Layout: Choose from the following desired layouts for printing the StarTrack label. vi) Weight/Dimension Unit: Shows the default weight and dimension unit, that is KG/CM. vii) Shipment Content: You can provide a description of the shipping contents. This description will be printed on all the printed documents and is usually required for security checks and customs. viii) Custom Shipment Message: The plugin provides flexibility to customize shipment tracking message. This message will appear in the email, WooCommerce Admin order page, and Customer’s Orders section (under the My-Account page). You can use placeholders to fill the details of the shipment, automatically. You can frame the message by including tags [DATE], [SERVICE] and [ID]. Details of these tags are given below. [DATE] Shipment date will be replaced in the order page tracking section. [SERVICE] Selected shipping service will be replaced in the order page tracking section. [ID] Tracking code will be replaced in order page tracking section. Your order was shipped on 2018-01-01 via Australia Post. To track the shipment, please follow the link of tracking IDs EN428785455IN, EN428785456IN. Note: The link on shipment IDs leads to the live tracking details on their website. Your order was shipped on 2018-01-01 via Australia Post. Your order was shipped via Australia Post. To track the shipment, please follow the link of shipment IDs EN428785455IN, EN428785456IN. Your order was shipped via Australia Post Service. Once all settings are configured, save changes. Real-time rates are calculated based on product dimensions and weight, and the best-fitted box rates are returned from Australia Post. This rates will depend on the method used for packing the parcel. A complete, step-by-step explanation about these parcel packaging options is given in the Parcel Packaging section of the main documentation. Once you have configured all the settings, go to your front-end of the store to test the settings. 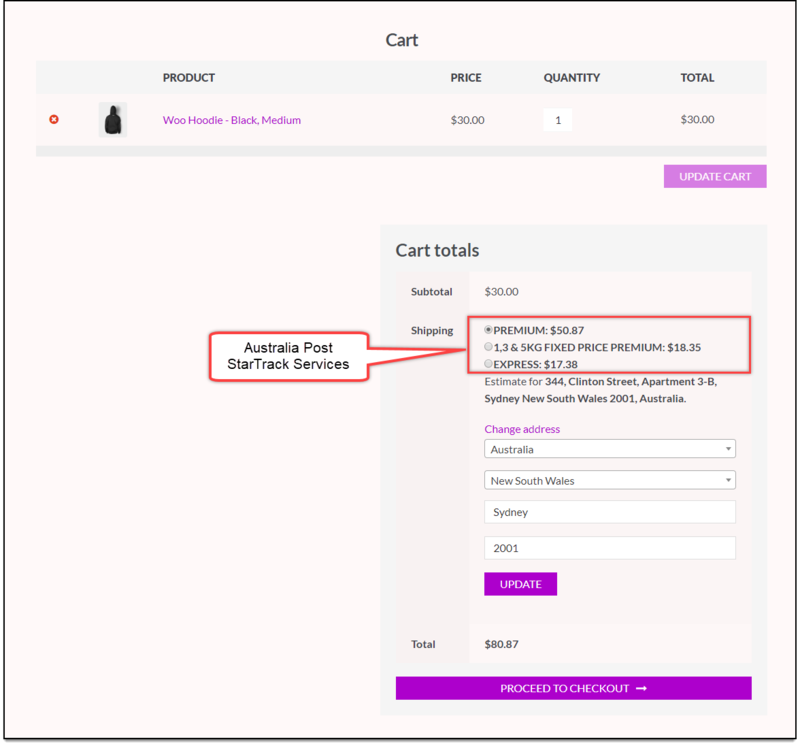 After a product is added to the cart, the plugin will calculate the estimated shipping rate and will display them as shown in the screenshot below. How to print StarTrack shipping labels? Printing StarTrack shipping labels is very much similar to printing eParcel shipping labels. You can follow the same step-by-step demonstration given in the main documentation. A sample StarTrack shipping label is shown below. How to generate StarTrack order summary/manifest? This procedure is similar to that for Australia Post eParcel account. You can follow the same step-by-step demonstration explained in the main documentation of the plugin. 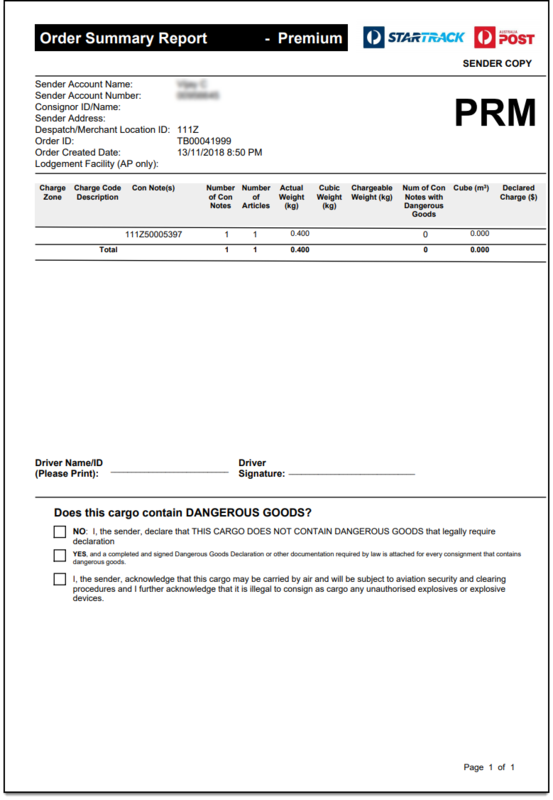 A StarTrack Order Manifest consists of two documents; Driver Copy and Sender Copy. 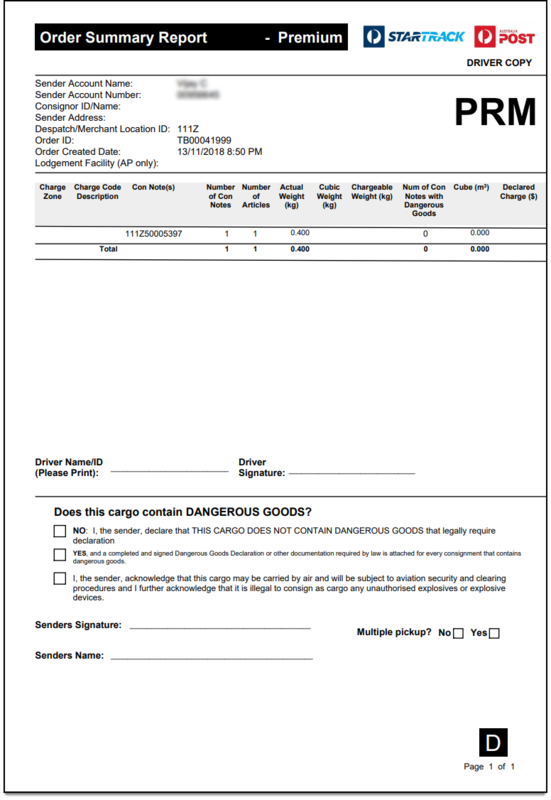 A sample StarTrack Order Manifest Driver Copy is shown below. A sample Sender Copy of StarTrack Order Manifest is shown below. To generate StarTrack shipping labels in bulk, you would need our ELEX WooCommerce Australia Post Bulk Label Printing Add-On. 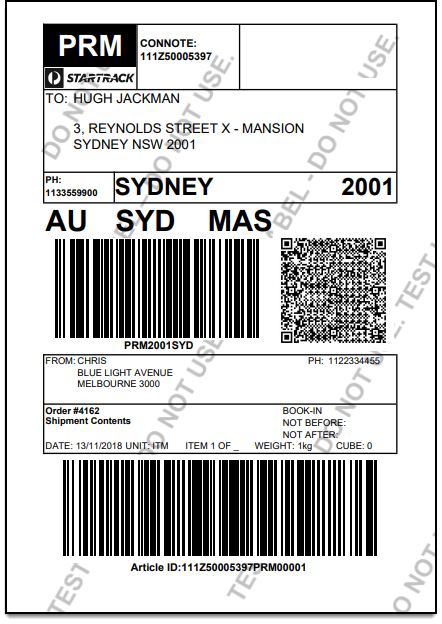 Once you have purchased this add-on, you can read how to bulk print Australia Post shipping labels to set up the add-on. The steps to configure shipment tracking is same as for an eParcel account. Follow the step-by-step demonstration explained in the main documentation for tracking shipment orders.